The speedboat is about three miles offshore when a U.S. Customs and Border Protection agent cuts the engine to drift on the current in quiet darkness, hoping for the telltale signs of immigrant smuggling - sulfur fumes or a motor's whirr. "It's like trying to find a needle in a haystack, and the haystack is the Pacific Ocean," agent Tim Feige says minutes before sunrise marks the end to another uneventful shift. Sea interdictions and arrests have spiked year-over-year for three years, as enforcement efforts ramp up to meet the challenge. While only a small fraction of border arrests are at sea, authorities say heightened enforcement on land, and a bigger fence, is making the offshore route more attractive. The number of Border Patrol agents doubled to more than 20,000 since 2003, and President Barack Obama is dispatching the National Guard after clamor for a crackdown in the desert led to Arizona's tough new immigration law. "Your options are to go east through the mountains and the desert, or west through the ocean, or you tunnel underground," said Michael Carney, deputy special agent in charge of investigations for U.S. Immigration and Customs Enforcement in San Diego. "I think they found that going west through the ocean is probably their best bet." U.S. agents have arrested 753 suspected illegal immigrants on Southern California shores and seas between October and Aug. 24, up from 400 the previous 12 months and 230 the year before. They have spotted 85 watercraft since October, up from 49 during the previous 12 months and 33 the year before. The smugglers use old, single-engine wooden vessels known in Mexico as "pangas." They're several feet (about a meter) wide and about 25 feet (7 1/2 meters) long. If they are found on U.S. waters, they're almost invariably smuggling people or drugs. U.S. authorities have stepped up sea patrols near the border, forcing pangas loaded with illegal immigrants and sometimes with marijuana farther offshore with landings farther north. An abandoned vessel was found in November in Laguna Beach, 85 miles (140 kilometers) north of Mexico. A boat with 24 people was found 43 miles (69 kilometers) off the San Diego coast in May. Six boats have landed at Camp Pendleton Marine Corps base, more than 50 miles (80 kilometers) north of the border, since November, including two that were abandoned. The base, only a short hike to Interstate 5, has stepped up security. Authorities believe smugglers put their passengers ashore and return to Mexico, when possible, to avoid losing their boats and leaving evidence behind. But they also quickly abandon the boats and run for it if they sense they're about to be caught. Smuggling on California waters dates back to the alcohol trade during Prohibition, when alcohol was illegal in the U.S. in the 1920s and early 1930s, but authorities noticed a change in late 2007 when pangas began traveling without lights at night with up to 25 people packed on open decks. At up to $5,000 a person - roughly twice the fee to cross illegally over land - one overnight trip can generate $100,000. Some arrests at sea may be a result of heightened enforcement. This year, the Orange County Sheriff's Department joined in boat patrols on a 32-mile (52-kilometer) coastal stretch south of Los Angeles. Only two immigrants are known to have been killed crossing in U.S. waters, their boat overturning in the San Diego surf in January. Two months earlier, eight were rescued atop an overturned boat that was adrift for a day. Smugglers have been arrested on both sides of the border, with those in the U.S. being sentenced to a year or two in prison. In Mexico, the boats launch from a poor fishing village named Popotla, about 15 miles (25 kilometers) south of the border. It sits between Playa de Rosarito's high-rise hotels and condos that cater to American tourists and expatriates and next to the studio where the 1997 blockbuster "Titanic" was filmed. Squatters live in about two dozen shanties crammed on a hillside on federal land. There is no electricity, paved road, sewage or garbage collection. But it is easy to understand why smugglers are drawn to the village. It's out of view from the highway only 200 meters away. Its crescent-shaped beach invites gentle waves and it is the only public boat launching spot on a 50-mile (80-kilometer) stretch south of the border. Locals flock to Popotla's two dozen or so restaurants on weekends for a wide array of fresh catches. Beachgoers drive pickups down a short, steep road and park right up to the tide. A restaurant worker, Victor Estrada, said he saw about eight migrants being led to a boat on the beach one recent night after they waited several hours inside a sports utility vehicle, but about a dozen other workers and residents insisted they knew nothing about smugglers. "You see nothing during the day but fishermen," said Carlos Verdugo, 48, president of one of Popotla's 11 fishing cooperatives who lives in nearby Tijuana. "It's possible (the smugglers) come at night. During the day, it's pure fishing." Jose Eduardo Montero, public safety chief of Playas de Rosarito, offers a different view: "The place is invaded by criminals, drug traffickers, undocumented immigrants, drug dealers. It's all mixed in with the fishing business." One January night, Montero said, his officers detained 23 people as they were preparing for a crossing, including two alleged guides who were arrested on smuggling charges. Authorities have failed to pierce the top ranks of smuggling organizations. Boat drivers offer little information when captured and toss their GPS devices and radios into the water before agents reach them. The low-slung boats, when weighed down with people, can float only about one foot above water, making them difficult to see on radar. Night-vision binoculars have limited reach. "They're beating us with low-tech," said ICE's Carney. "I'm not saying they can't be detected, but I'm saying they're very hard to detect." 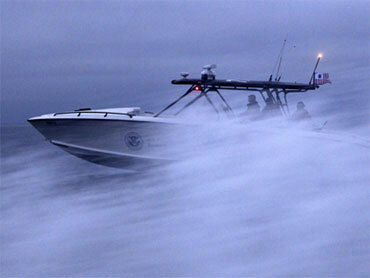 On a recent night off San Diego shores, two CBP speedboats prowled the coast. A CBP helicopter with infrared surveillance equipment was down for repairs, which happens pretty often, said CBP supervisory agent Mark White, his boat idled with Tijuana's lights behind him. "We're one step behind," he says. White spent much of the night near two unlit beaches that are popular with smugglers. He described the positioning as educated guesswork. Just because boats have been landing north, he can't afford to neglect beaches close to the border. Some migrants dash one mile from Tijuana on Jet Skis, hugging the shore. "We're trying to smell, we're trying to see, and we're waiting," White said. This night, like most others, concluded with no arrests or boat sightings. Agents got lucky the following night, arresting 23 suspected illegal immigrants from Mexico on a boat about five miles (eight kilometers) offshore from San Diego's tony La Jolla area around 3 a.m. The driver said he was being paid $600 for his work and knew his employer only as Frausto, according to court records. A passenger who said he agreed to pay a smuggler $5,000 dropped a GPS device in the ocean as agents arrived, sinking potentially promising evidence.